1. Ideally, you want to move everything out onto the driveway. Choose a day when no rain is forecast and just pull everything out of the garage. 2. Clean, clean, clean. Run the hose into the garage, get a scrubbing brush, and tackle the inevitable oily and grimy spots. Sweep the dust out of the corners. 3. Check the garage door. 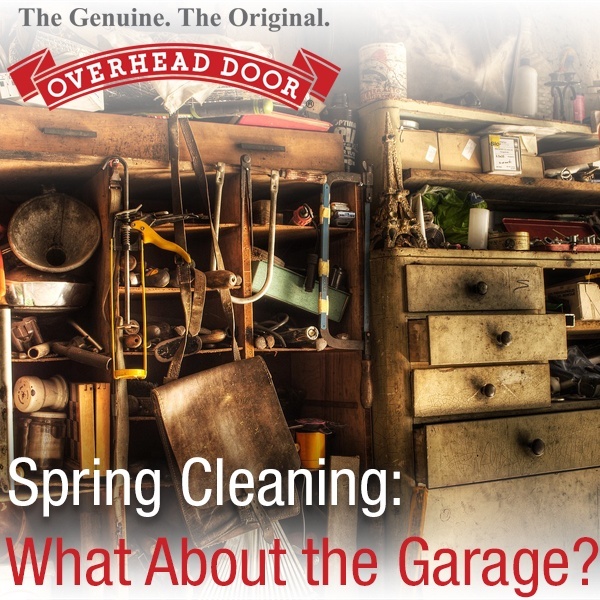 If you haven't used your garage all winter, it may be stiff or sticky. Make sure it opens and closes smoothly - if it doesn't, then you may want to get it serviced. Contact us today to get that scheduled! Stuff that doesn't belong in the garage. Especially if you use the garage entrance as a back door, clothes and shoes can wander into the garage and need to be chased back into the house. Trash. This includes any items that are broken beyond repair, expired items, etc. Hazardous waste. Make a separate box for anything considered hazardous waste, such as some auto maintenance products, so it can be disposed of properly. Things you haven't used in several years - these can be given away. If you think something is repairable but don't want to repair it you may be able to find a home for it. Stuff you know you want to store in the garage. 4. Take that last category and store it properly. Use bins or shelves to keep everything organized. If you don't have enough shelves then consider getting more - or whether you are keeping stuff you don't need. 5. Repair or replace your garage doors to give the ultimate curb appeal for the summer! Overhead Door of the Permian Basin™ is able to do both. The idea is to end up with a clean, organized garage in which you have more than enough room to get in and out of your car.